On Palm Sunday, 1461, the Wars of the Roses descend on Towton, where a bloody, decisive battle literally crowns the Yorkist rebellion against Lancastrian King Henry VI. Anthony Woodville, Lord Scales, numbers among the Lancastrian dead, or so it seems. Yet he revives, having dreamed during his resurrection the most impossible events, including a ceremony involving the Holy Grail. Almost as miraculously, the new monarch presumptive, Edward, accepts his oath of loyalty. Anthony is neither the first nor the last great noble to change allegiances during the Wars of the Roses, but suspicion naturally clings to him. His rise — in all senses of the word — attracts enemies whose smiles must not be taken on trust. That’s true even, if not especially, after his sister, Elizabeth, marries Edward and becomes queen. The king’s brother-in-law stands to gain great wealth, power, and fame, which provokes jealousy among rivals and also means he is constantly at the crown’s beck and call. Wonders Will Never Cease conveys the terror and chaos of England plagued by civil strife, yet this is no standard, ordinary historical tale, even though events follow the facts, and every character actually existed. If you’re looking for, say, The Kingmaker (Richard Neville, Earl of Warwick), he’s here, and so are Richard, Duke of Gloucester, and a host of others familiar from song and story. Rather, it’s how Irwin presents these people and their actions that seems original. As an astute reviewer for the Guardian noted, the narrative reads like a Terry Pratchett fantasy, and a marvelously rich one it is. At times very funny but also deadly serious, the novel explores the uses and misuses of storytelling; whether heroes deserve admiration; and how inflated reputations entrap living legends. In other words, Irwin’s writing about spin, and what’s left when you delve through it to the truth underneath. Do you find a hero, or a man on the make who’s too quick to avenge a slight or enrich himself? In the process, some famous figures take a drubbing. 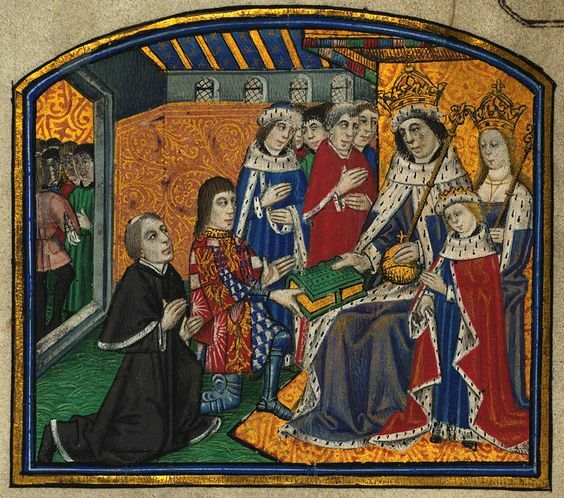 Sir Thomas Malory, author of Le Morte d’Arthur, attaches himself to Anthony, who, after listening to the legends, frankly wonders whether these Knights of the Round Table were such paragons after all. It is true that I have a laboratory equipped with furnaces, alembics, and pelican flasks. The King has been very generous and I find metals and volatile fluids good to think with. Making gold from lead would be merely vulgar. There is enough gold in the Kingdom as it is. No, my primary task is to distil base ambition and intrigue into high policy. Also I seek a cordial which will cure the [rebellious] ferment in the north… Also I publish prophecies which, because I have published them, come to be fulfilled. What results, however, has far-reaching consequences. Ripley embellishes Anthony’s history to include battles with imaginary demons and ascribes acts of chastity and piety that even the son of a fifteenth-century English earl would hesitate to claim. Ripley knows that not everyone will believe everything, but that everybody will believe something, which makes him a sort of Abraham Lincoln before his time. And lest you think, as I did, that Ripley is too coincidental a name for a fabricator par excellence, let me repeat: He’s a historical figure. But he probably didn’t spin tales like these, and I doubt very much whether he actually devised a Talking Head to tell the future. I love that touch, which sounds like a satire on today’s pundits, the only difference being that Edward IV’s version is always right. You can spin what you like, but you can’t outrun your fate. To enjoy Wonders Will Never Cease, you have to like long interruptions to the forward narrative in which the characters tell stories and comment on them. But these tales have a purpose beyond the telling. They lead Anthony, who starts out as less than the deepest thinker, to consider the purpose of his life and what his fame actually means. And if we, the readers, ponder these issues too, I think Irwin has accomplished his purpose.